VARCO replacement patio door's fully-welded construction, aluminum reinforcement and superior wedging interlock provide a tight seal between the door sashes, keeping winter’s chill and summer’s heat outside of your home. Plus, our exclusive monorail track design allows for smooth, easy operation. 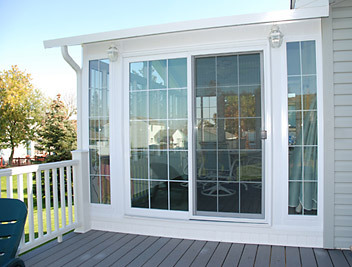 Our patio door offers optional glass packages specifically tailored to your climate. Our low-emissivity glass (LoE2) allows natural light to freely enter your home. During winter months, the glass helps to keep rooms warmer by reflecting heat back into the home while letting warm, solar rays enter. In the summer, the LoE2 glass blocks infrared and ultraviolet radiant solar energy, keeping your rooms cooler. This energy efficient patio door's warm-edge, insulating glass sealant systems flex with the glass in hot or cold temperatures to help prevent sealant failure. These insulating spacer systems keep the edges of the glass warmer, dramatically reducing condensation. Optional insulating gases, such as Argon or Krypton are added to enhance the replacement patio door’s thermal performance, while saving you money on your heating and cooling bills. Security is a definite priority in the design of the patio door. Keyed, dual-point grappling hook locks are standard on all systems and can be upgraded to keyed, multi-point* locks with four locking points. In addition, a standard recessed security bolt is conveniently mounted on the trailing edge of the operating sash, enhancing the security of your patio door. VARCO sliding glass doors offers a wide range of options to add character while complementing the decor of your home. Choose from two or three panel door styles, decorative grid accents and classic hardware options. You can also opt for a stained-glass look in your replacement patio door by selecting from the elegant glass patterns. For additional privacy and the ultimate in convenience, our inside-the-glass, tilting mini-blinds are the perfect solution. Available in a wide variety of painted exterior colors as well as interior woodgrain and paint/stainable laminate options.